(Nanowerk News) Combine liquid crystals (mesogens) and metal clusters and you get clustomesogens—a new class of compounds, the first examples of which have now been produced by scientists at the Universities of Rennes (France) and Bucharest (Rumania). As the team headed by Yann Molard and Stéphane Cordier reports in the journal Angewandte Chemie ("Clustomesogens: Liquid Crystal Materials Containing Transition-Metal Clusters"), when irradiated, the material glows intensely in the red and infrared range. 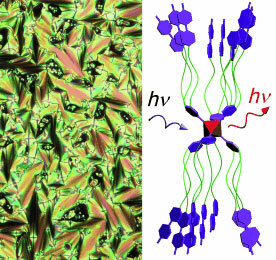 Bright red-NIR photoluminescent liquid crystals were obtained by grafting six promesogenic units onto an octahedral molybdenum cluster core (see picture). This hybrid self-arranges in a lamellar structure over a wide range of temperatures to give the first clustomesogen. Liquid crystals are familiar from LC displays. These materials behave like something between a liquid and a solid. On one hand, their molecules are oriented and partially ordered like in a crystal; on the other, they are not rigid, but truly mobile, like in a liquid. When a voltage is applied, liquid crystals can be switched between different states. Another class of materials of interest to the optoelectronics field is metal clusters. Clusters are aggregates of a few atoms. Such clusters of metal atoms show unusual electronic, magnetic, and optical properties that arise from the metal–metal bonds in the cluster, and the properties are completely different from those of macroscopic metal particles. The team was able to unite the interesting characteristics of both types of material in the form of a new class of materials called clustomesogens, which contain metal clusters in a liquid-crystalline phase. Liquid crystals with metal-metal bonds have been rare and limited to species with only two connected metal atoms. The scientists have now constructed a liquid crystal that contains octahedral clusters made of six molybdenum atoms. For stabilization, there are eight bromide ions coordinated as ligands above the eight surfaces of the octahedron. The researchers attached special organic ligands to the six corners of the octahedron. These ligands are aromatic rings, each equipped with three long hydrocarbon chains, the ends of which are also made of two aromatic rings. Simple warming triggers a self-organization process by which the clusters stretch out to form long, narrow units (see figure) arranged in a lamellar structure. The flat rings at the ends of the ligands of neighboring layers are interleaved; this structure has liquid-crystalline properties. The material shows strong luminescence in the red/near infrared range when excited over a broad range of wavelengths, and this type of material may be useful for the production of red displays and infrared signals. The new class of compounds has been patented in the USA in November 2009 as no. 61/264888.